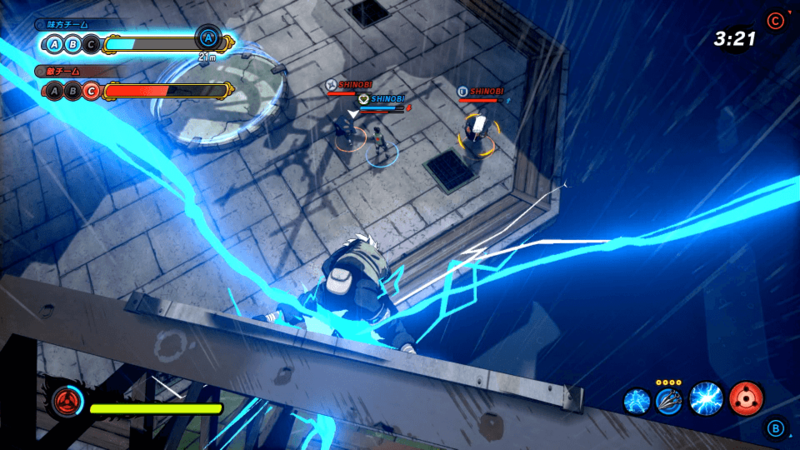 Naruto to Boruto: Shinobi Striker is a game that I found fun to play, with one single real hangup, on the E3 2018 showfloor at the BANDAI NAMCO showbooth. Naruto to Boruto: Shinobi Striker is billed as a online game where teams of four compete with each other to determine who the best ninjas are. Furthermore, you get to play as some of your favorite classic Naruto franchise characters as they battle it out. During my hands-on demo of Naruto to Boruto: Shinobi Striker for the PlayStation 4, I found myself on the blue team in a game of Capture the Flag (three flags to win) as a melee-class character. The control scheme was fairly simple: L1 and R1 use different Ninjutsu attacks, R2 activates your Ninja Action, D-pad Up uses the Secret Technique, D-pad Down sends a message to the party, Square does a close-range attack, Triangle activates a strong attack, Cross is to jump, and Circle is for Ninja Tools. It is worth noting that the Ninjutsu works on cooldown timers, so you can’t spam those attacks back-to-back for the entire match. But despite all of these different options, however, the control scheme in Naruto to Boruto: Shinobi Striker felt a bit clunky to use with any real efficiency as required for a multiplayer game. The special ninjutsu abilities, while fun to use, often did not give me a reason to use them over the basic attacks when striking down opponents. I found that the most efficient way to kill your opponents was to use a chain of basic attacks and ninja tools and almost completely ignore using ninjutsu while doing so. This is unfortunate, as it is clear that the ninjutsu is something that the game clearly wanted me to use to fight with. Combat is four on four in Naruto to Boruto: Shinobi Striker. (Image owned by BANDAI NAMCO). 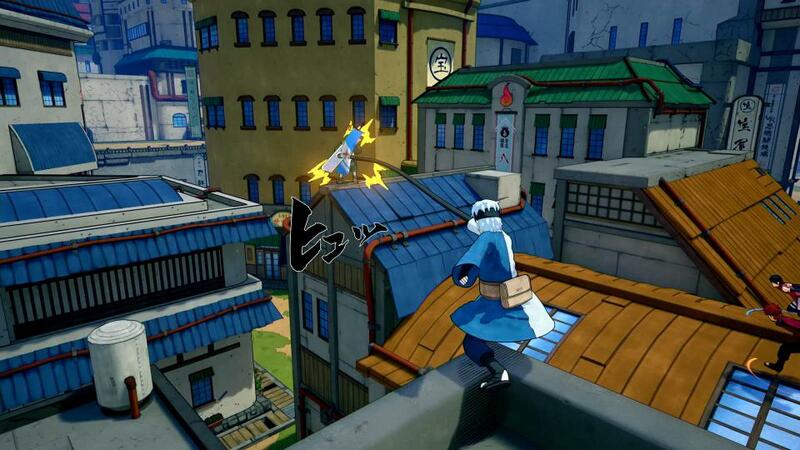 Where Naruto to Boruto: Shinobi Striker really grabbed my attention, however, was the freedom of movement in the game. Our match took place in a town that was clearly inspired by the Naruto anime series (the graphics are seriously gorgeous and borrow directly from anime). I kept wanting to stop and look around at the world that I am fighting in, even though I really couldn’t do so. Additionally, the characters are not just limited to running along the ground but instead fling themselves up walls and across rooftops for both running and combat. This fun feature added a huge number of options for both combat and to ambush the opposing team, and I kept trying to use these wall running/building hopping as much as I could. Furthermore, I loved how Naruto to Boruto: Shinobi Striker implemented Capture the Flag. Here, unlike in other games, you can’t just simply cheesily grab the flag as you’re dashing by and then run off with it to your own side. Instead, when you arrive at the enemy’s flag, you actually have to stand on the other team’s flag platform for a few moments before you’re allowed to seize their flag. This both gives the enemy team a real, genuine opportunity to defend their flag by killing you off and also requires your team to work together in order to be able to take the opposing flag in the first place in a bit of a King of the Hill game scenario. It is smartly implemented and well done, and made for some exciting matches around each side’s flag station. Combat takes place on rooftops, walls, and floors. (Image owned by BANDAI NAMCO). Ultimately, I had fun playing Naruto to Boruto: Shinobi Striker. The controls, however, do drag this game down (from my demo, at least) and make it something worse than it really should be by any means. This is a game that I could see myself picking up at some point and playing, especially if this one issue is fixed by release. You can preorder Naruto to Boruto: Shinobi Striker now for PlayStation 4, Xbox One, and PC. Are you ready to get together with your friends to play Naruto to Boruto: Shinobi Striker? Who are you most excited to play as?